John Norris Bahcall was born on December 30, 1934 in Shreveport, Louisiana. His mother, Mildred, was a pianist and both she and his father, Malcolm Bahcall, worked in a family business. He did not take any science classes in high school because he was excused to play tennis in the afternoons and he went to the Louisiana State University in Baton Rouge, Louisiana on a tennis scholarship, where he studied philosophy with the goal of becoming a rabbi. After a year he transferred to the University of California Berkeley, still studying philosophy. At Berkeley he took his first physics class as a graduation requirement. He graduated with a A.B. physics, from UCB in 1956. He earned his M.S. in physics from the University of Chicago and his Ph.D. in physics from Harvard University in 1961. He became a research fellow in physics at the University of Indiana in 1961 and worked at the California Institute of Technology from 1962 to 1970. He was appointed professor of physics at the Institute for Advanced Study in Princeton, New Jersey in 1971, where he remained the rest of his career. Bahcall's field was astrophysics. He worked on many problems in astrophysics, but he is most remembered for his work on stellar neutrinos. Stars produce energy by a series of different nuclear reactions converting hydrogen to helium. One of the products of these reactions are electron-neutrinos. Neutrinos are neutral subatomic particles and come in three "flavors", electron-neutrinos, muon-neutrinos and tau-neutrinos. Because they do not have a charge, they do not interact with other substances and generally pass directly through. It has been estimated that every centimeter of the earth, exposed to direct sunlight, has 65 billion neutrinos pass through it per second. To detect the neutrinos as they pass through the earth Bahcall, working with Raymond Davis Jr., did the theoretical calculations for a detector that was built in the Homestake Gold Mine in Lead, South Dakota, using a 380 cubic meter tank filled with dry cleaning fluid (tetrachloroethylene). The chlorine atoms in the dry cleaning fluid are transformed into argon when they are hit by an electron-neutrino. The argon is collected and the amount of electron-neutrinos hitting the tank can be counted. The initial results of the experiment, announced in 1968, found only one third of the amount of neutrinos predicted by theory. For thirty years Bahcall worked on the problem and it was eventually determined that some of the neutrinos change from electron-neutrinos into muon- and tau-neutrinos and were not detected by the chlorine in Bahcall and Davis' experiment. 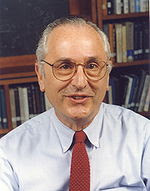 Bahcall won many honors during his career, including the Comstock prize in physics from the National Academy of Science and the Gold Medal from the Royal Academy of Science. He is also responsible, with Lyman Spitzer Jr., for designing the Hubble Space Telescope put into orbit in 1990. In 1992 he received NASA's Public Service Medal for this work. Bahcall also worked on understanding how our galaxy is put together and the current model of our galaxy, with a super-massive black hole at its center, is called the Bahcall-Wolfe model. Bahcall died on August 17, 2005.